A violation of Florida Statute Section 322.2616 (often called the zero tolerance suspension) is neither a traffic infraction nor a criminal offense, nor does being detained pursuant to this statute constitute an arrest. Actions taken pursuant to this statute are recorded in the motor vehicle records maintained by DHSMV. Actions taken under this statute do not necessarily bar prosecution under Florida Statute 316.193. However the Department of Highway Safety and Motor Vehicles (DHSMV) is not permitted to suspend the person’s license under Florida Statute 322.2615 and 322.2616 for the same episode. 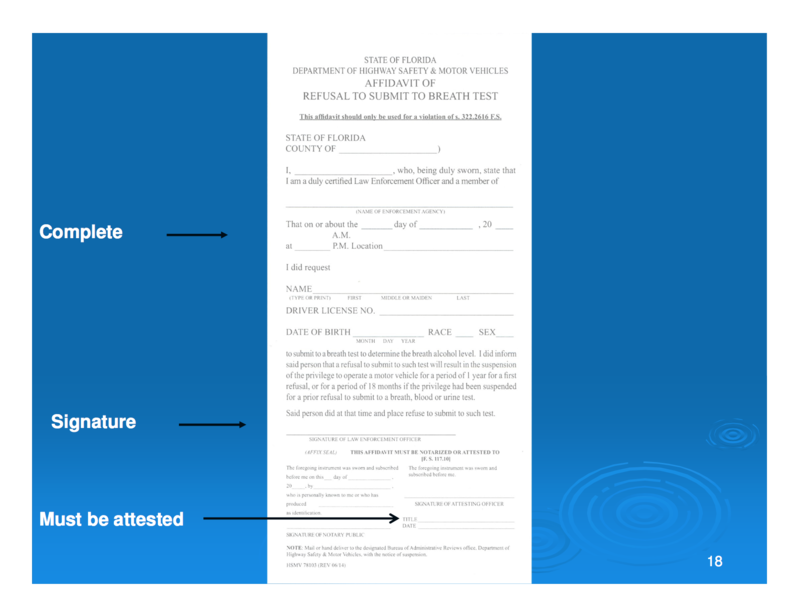 If you received a notice that your driver’s license will be suspended because you are under 21 years old and drove with an unlawful breath alcohol level of .02 or above, then act quickly. You only have 10 days to hire an attorney to contest the administrative suspension. Your attorney can request a hearing at the DMV office to ask a hearing officer to invalidate the suspension. In many of these cases, the under 21-year-old driver is detained on the side of the road until the notice of the zero tolerance suspension has been issued. Then the driver will be released from the scene or the young person’s parents will be called to pick them up. But in most of these cases, the young person is not arrested for any criminal offense. Many of these suspensions are invalidated (removed from the driving record) because the rules are so complicated that the officers often make mistakes. Any mistake might mean the hearing officer will invalidate the suspension which will save you money on the reinstatement fees and your insurance for years to come. The DUI Defense Attorneys at Sammis Law Firm represent young people charged with drinking and driving throughout Hillsborough County. We can fight the administrative suspension and/or any criminal case in court. If you are under 21, call an experienced DUI Attorney for Zero Tolerance .02 DUI suspensions in Tampa, FL, at the Sammis Law Firm. We also have offices in New Port Richey and represent clients throughout the greater Tampa Bay areas including all of Pasco County, Hernando County, Pinellas County, Manatee County and Polk County, FL. Contact us to find out more about Florida Statute Section 322.2616.
the differences in the “notice of suspension” for adults and zero tolerance. Under F.S. 322.2616, it is unlawful for a person under the age of 21 who has a breath-alcohol or blood-alcohol level of .02 or higher to drive or be in actual physical control of a motor vehicle. A suspension for a violation of the “Zero Tolerance” law does not bar prosecution for DUI (under section 316.193, Florida Statutes). However, if a person is suspended under 322.2616, the person may not be suspended for the same episode under section 322.2615, Florida Statutes. whether the person had a blood-alcohol or breath alcohol level of .02 or higher. Whether the person was told that if he or she refused to submit to a breath test, his or her privilege to operate a motor vehicle would be suspended for a period of one year, or in the case of a second or subsequent refusal for a period of 18 months. A breath test to determine breath-alcohol level may be conducted by a preliminary alcohol screening test device (often called the “PBT”) listed in the U.S. Department of Transportation’s conforming products list of evidential breath measurement devices. Pursuant to Section 322.2616 F.S., these notices are to be issued only to persons operating or in actual physical control of a motor vehicle who are under the age of 21 and have a breath alcohol level of .02 or higher, or refuse to submit to a breath test authorized in Section 322.2616 F.S. This suspension notice should always be used for a violation of Section 322.2616 F.S. 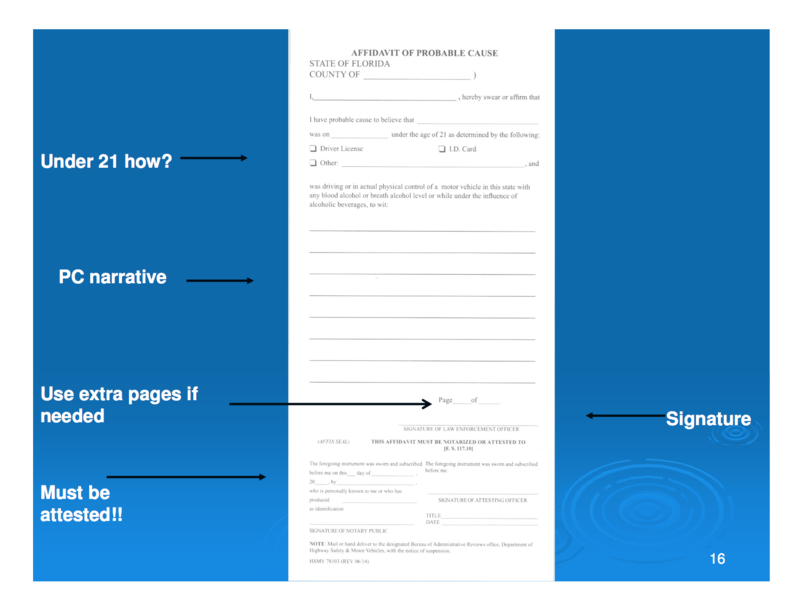 The following documents must be forwarded to one of the 16 hearing offices of the Department of Highway Safety and Motor vehicles, listed on the reverse side of the officer-agency copy of the notice. These documents must be submitted within FIVE CALENDAR DAYS after the date of the issuance of the notice of suspension. Hearing officer’s copy of suspension notice (HSMV 78103)(DO NOT list on transmittal form). Affidavit stating grounds for belief that the person was under the age of 21 and was driving or in actual physical control of a motor vehicle with any breath alcohol level. 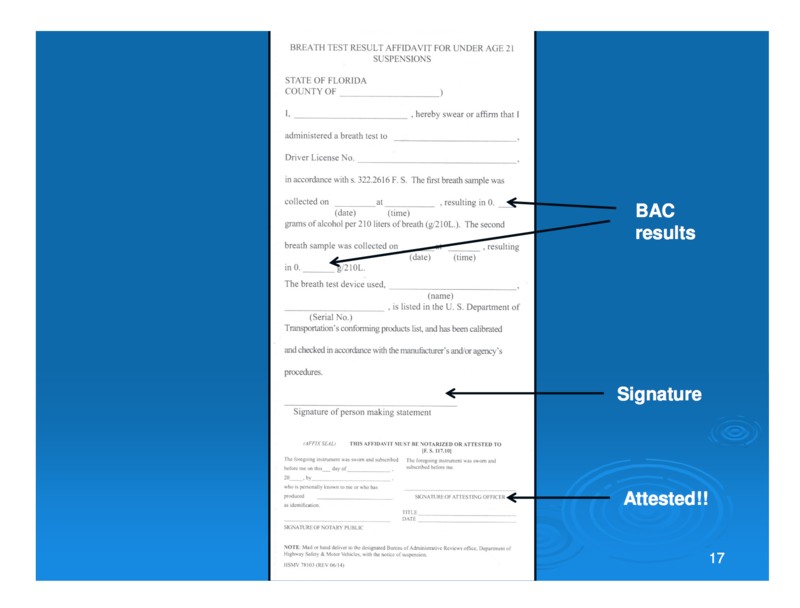 Affidavit stating that a breath test was requested by a law enforcement officer and that the person refused to submit to such test, and was read the implied consent warning. I am not requesting that you submit to a test of your breath for the purpose of determining the alcoholic content of your breath. If you refuse the best, your privilege of operating a motor vehicle will be suspended for a period of one year or 18 months if your license has been previously suspended for refusing to submit to a required test. The yellow copy of the notices are sent to the DHSMV Hearing Officer’s Copy. The driver gets the yellow copy and the officer-agency gets the pink copy. 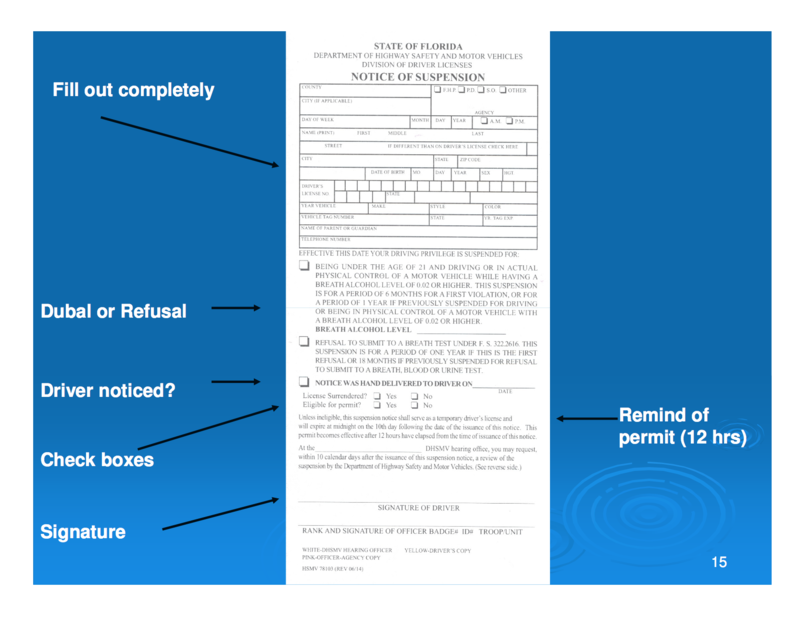 If you were given a notice that your driver’s license will be suspended under F.S. 322.2616 because you drove with a breath alcohol level of .02 or above (or if you refused to submit to the test requested), then contact an experienced DUI attorney in Tampa for driver’s under the age of 21 years old. We represent young people charged with DUI throughout the greater Tampa Bay area including Hillsborough County, Hernando County, Pasco County, Manatee County and Polk County, FL. Contact us to discuss your case today to discuss your rights during an administrative hearing at the Bureau of Administrative Reviews Office in Tampa, FL.